We spent Thursday evening through Sunday morning with my husband's family. They live in another state. J4 had an eventful Friday evening that included a trip to the Urgent Care Clinic. Thankfully, Saturday and Sunday passed without any further trauma! Saturday afternoon the kids, Daddy, their cousins and a few of the dogs played football! Many times throughout our stay we'd make our way out to the old farm and explore the pond. They have two, but one is not easily accessible and we've only explored it a handful of times. The little (and big) ones found tadpoles and lots of interesting rocks and wildflowers around the first pond. (pic. 2)Saturday night we enjoy a nice big bonfire and roasted hotdogs and huge marshmallows courtesy of Aunt W. (pic. 3)We also tried a new recipe I had read about somewhere, but I'm not sure where - s'mores with Reese's Peanut Butter Cups. They were so good! (pic. 4)The kids helped gather wood for the bonfire and (pic. 1) C8 made a comfy spot for all of her favorite animals (the ones she brings on every out of town trip) and they attended the night's festivities with the family. C8 made sure to play a few piano pieces before our trip ended. PaPaw joined in on guitar during Away in a Manger, too! I love being apart of a musical family. C8 spent a couple of hours on Tuesday learning to sign The Revelation Song. C8 took an ASL class last semester with a wonderful teacher, Ms. A in our co-op. They learned two worship songs ~C8 had never used ASL with worship before~ and performed them in front of our whole co-op. It was beautiful and brought me to joyful, spirit-filled tears. C8 loves Jesus so much and it shows through her worship, which now incorporates ASL. Watching her worship is touching and draws you into a deeper, more intimate worship experience with Jesus. I've been wanting to hear authentic Uncle Remus storytelling for years! Finally, we went to the Wren's Nest on Friday with a few others from our homeschool group. We learned more about the wonderful Uncle Remus stories, how they came about and the man who put them down on paper, Joel Chandler Harris. We toured his home (with the best tour guide ever, 80 year old Nana!) and heard a fabulous storyteller retell a few of these classic stories. Once home we read at least an hours worth of tales from The Favorite Uncle Remus a book we bought at the Wren's Nest gift shop - for much more than the Amazon price... It's written in the original dialect, but if you're from the deep south, you shouldn't have much trouble reading it. Though I could read it aloud and understand it, there were many times the kids still needed the meaning translated. Our fabulous storyteller and superb entertainer! There is one new read aloud that I must mention from a twitter friend, Timothy Davis' Sea Cutter: Book I in The Chronicles of Nathaniel Childe. I had bought the ebook several months earlier from Amazon. I began reading it late one night and absolutely loved it! I finished it the next evening. At that time, I thought the kids might not be ready for a rather intense and suspenseful adventure drama. Sea Cutter was recently released in paperback and the kids received a gorgeous signed copy Saturday from Mr. Davis. He hasn't asked me to review it, but it is so wonderful I just have to. I hope to do that in the next few weeks. Let me just say that C8 wouldn't let me stop reading that day until the very last word was read! Thankfully, we didn't have anything going on Saturday afternoon and we just spent hours reading Sea Cutter to the very end! There are subtle Christian undertones throughout that the kids and I appreciated, too. This is just a small little bit of highlights from this week, but some of our very favorites! I don't know about your family, but we spend at least three hours in the car each week. I am always looking for ways to make sure this is time well spent. The Sugar Creek Gang Audio Aventures has been just perfect for our time in the car. 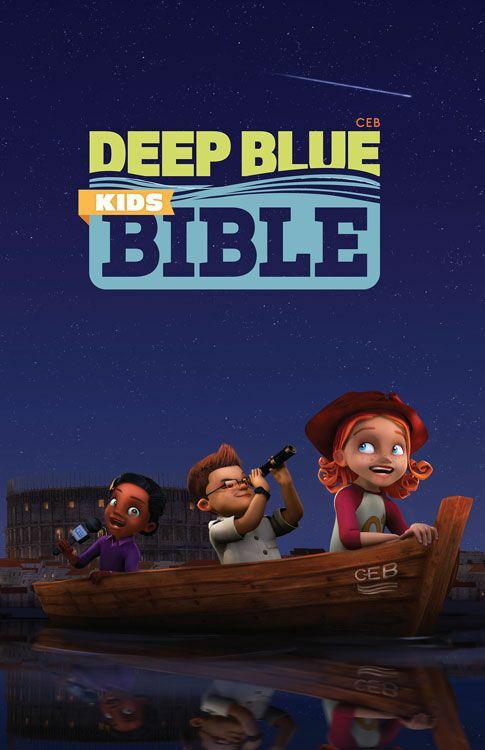 It is great literature with poetry, Bible verses, nature lore, science lessons and the gospel message presented in a fun and adventurous, yet heart-felt story. The children aren't perfect, but their hearts are in the right place. You are drawn in to their story. stand alone, because "there is a spiritual foundation that is built upon as the series progresses." I do love having our children listen to stories of a simpler time, even a bit old fashioned if you will. And even though they were written many years ago, the first was published in 1939, the stories are still enjoyable and applicable in today's world. The narrator of the "Audio Adventures" we are reviewing is excellent. His ability to create a plethoria of voices is simply amazing. Paul Ramseyer began the recordings in 1953 and re-recorded them three times into the '70's. Interestingly, two of the stories were completely lost in the '80's due to "politically incorrect verbiage" and were rerecorded a little over ten years ago by Mr. Ramseyer. The sound quality of the CD's is exellent! Since the "Audio Adventures" were originally recorded for radio, there are short instrumentals to signal a break-nothing too distractful. In fact, in some instances the breaks were timed just perfectly for us to take a quick break as well. ~You can sometimes hear a slip of the tongue by the narrator, but this did not bother us at all. In fact, this gave the stories a more personal feel. We reviewed the first of six volumes, Sugar Creek Gang Volume 1 CD's. It retails for 54.95. This set contains 12 CD's and six stories: The Swamp Robber, The Killer Bear, The Winter Rescue, The Lost Campers, Chicago Adventures and The Secret Hideout. Each story is about two hours long. You may use the code HSING3-20 to recieve a 20% discount at checkout! Below is another very special gift from Beloved Books that I am excited to share with you! The Sugar Creek Gang has been a beautiful fit. Even our four year old enjoys them; our eight year old adores them! I love them because I know I am presenting wholesome, character building stories and filling their minds with overall themes that are excellent and admirable. You can read what other Crew members thought by clicking the link below. Disclaimer: As part of the Crew, I recieved the Sugar Creek Gang Vol. 1 audio stories in exchange for our honest review. Charlotte Mason encourages nature study of familiar places throughout the year. One place we've chosen for our familiar place is a nature area that is a short drive from our house. We try to go at least once a week. We will go when it's raining, when it's covered in snow (which is rare), when it's hot, when it's cold and when the weather is perfect. We will go in the morning, afternoon and evening too. It's good to make observations about the seasons and weather at a familiar place. In R6's new language arts program we are reviewing, IEW's PAL, we are studying a poem that has a reference to purple asters. So, on this particular nature walk, we were specifically looking for purple asters. Our whole family explored our favorite nature area for about two hours. 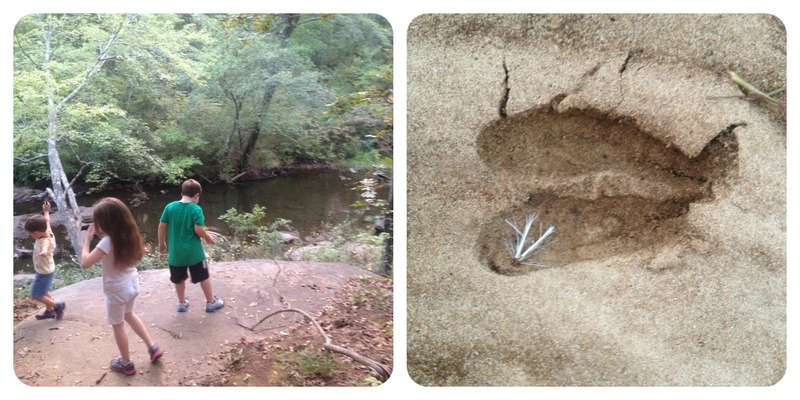 We found a great deer track, too! We took two field trips with our homeschool group this week. The first was a tour of our local police and fire department. We learned some great details about a policeman and fireman's job. We toured many of they key rooms, including the courtroom in the police department and the living quarters in the fire department. One of the most intriguing rooms was within the police dept. It had an enormous monitor showing more than a dozen live cameras in various places in our city. You never know when your being watched! The kids exploring a police car. 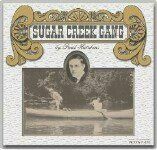 Our favorite resource this week: We have audio CD's of the Sugar Creek Gang to review. These sweet stories full of Christian values and adventure have been perfect during our extended time in the car this week. I assist in one of R6's co-op classes, Edible Art. We do such cute projects each week. R6 brings his knowledge home and regularly tutors his siblings on how to make art out of their food! Below, R6 has created a caterpillar with banana slices, peanut butter, a grape and noodles for the antennae. He also created a spider using an oreo, two tiny M&M's, frosting and licorice for the legs. 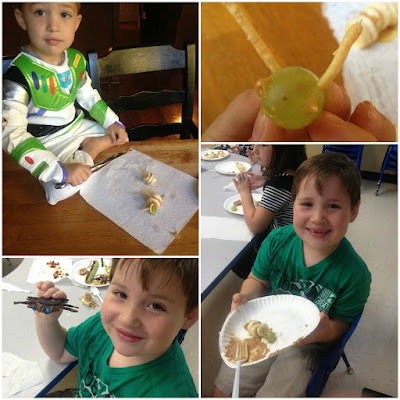 Buzz Lightyear made his own caterpillar after R6 gave fabulous instructions and C8 made eyes and a mouth with peanut butter on the caterpillar's grape head. I LOVE art and personal expression! On a personal note, we traded our paid-for van in on a new one. (The old one was having a few issues.) It's amazing how technology has changed in the last five years! Although it's not fun having payments again, we are loving our new ride. Near the end of the week, my mom drove up to visit and join us for our last field trip of the week. We attended Disney On Ice's Rockin' Ever After show. It was nice to share this memory with my precious mom. Here's one picture from the two hour performance. Sunday, Mom attended our church's 15 year birthday celebration. It was another very special day. Making extra time for friends is so important. I'm thankful that this week has been full of friends - outside of our normal activities. 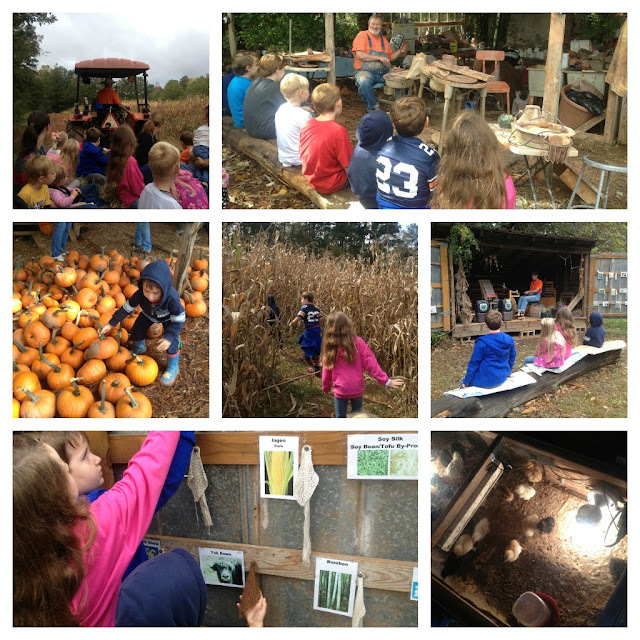 We enjoyed another field trip with our homeschool group! This time to a farm, and Daddy took a vacation day to join us! We toured the petting zoo, pumpkin patch, baby chick incubator, corn maze, took a hay ride around the farm, watched a pottery and spinning wheel demonstration, heard stories, and touched different types of fabrics. Best of all, we enjoyed our three hours at the farm with good friends! While at the pumpkin patch, we were invited over to sweet friends' house for dinner. We had the best grilled hamburgers and to top it off - the kids helped prepare our dessert ~ peach cobbler cooked in the fire pit. Our combined five kids from age 4 - 11 had the best time playing outside games the whole time! Over the four and a half hours we were there, the only time the kids sat down was to eat! ~ We are in the process of trying to plan a camping trip together, too! The next day, we schooled normally in the morning and in the afternoon another sweet friend came over with her 2 1/2 year old and newborn. Look what she brought for us! The ingredients to make Elderberry Syrup! We love Mrs. L and her sweet family. They are always thinking of sweet ways to bless our family. Next week, we are taking our kids on a field trip to the Wren's Nest for a tour and story telling by the Wren's Nest Ramblers! I've been wanting to visit this place for years - mainly for the storytelling! The Brer Rabbit stories are so much fun to read! Mrs. L and I share a love for Uncle Remus tales. The next day, we were invited over to a dear family's home to decorate potatoes for an Awana class project. We got to visit with an almost three year old, a three week old, an eight year old ~ that we took back to our house for the day and a precious mommy I've been friends with since we moved to GA.
J4 and his "forest" creation on the left and C8's Most Girly potato on the right. 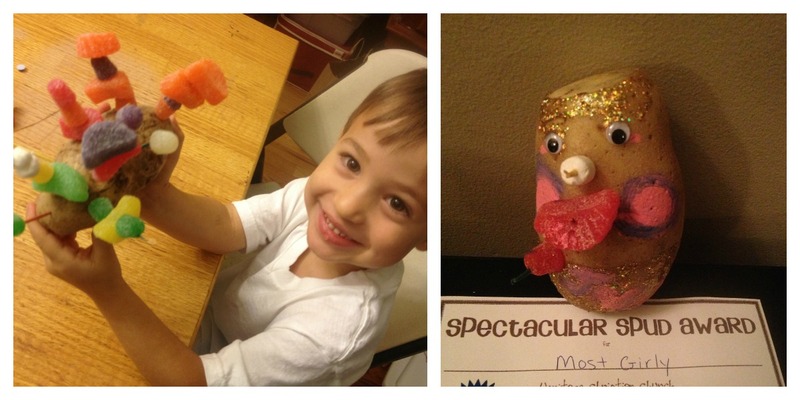 J4 came out of his last co-op class this week with "lion" whiskers. He really thought he was a lion and proceeded to sharpen his claws on a wall of bricks - this was at a restaurant, too. After taking a quick picture, we gently reminded him he was human and in a restaurant. We've enjoyed listening to the Sugar Creek Gang stories on CD. 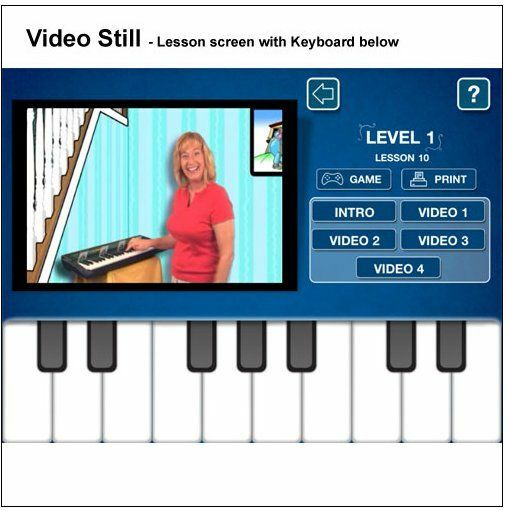 We are also reviewing and enjoying learning how to sing with our best voice using Teaching Kids to Sing, a DVD program. I've also figured out what I will be teaching next semester at co-op. Have you heard of the Wild Brothers? This DVD series is excellent. The kids and I have enjoyed watching and learning about tribal missions the past couple of weeks. C8 and I are excited about turning this series into a great co-op class for 2-3rd graders. ~ We have about three more weeks to explore two volumes from the Growing up Wild series and then we will post a review for the Crew. I've been thankful for online lessons the kids can do on their own. 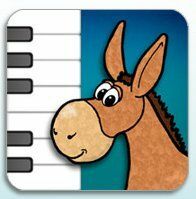 They've used a lot of our online subscriptions the past couple of weeks like Time 4 Learning, Speekee, ZooWhiz, the Kinderbach App (which is on sale today in the app store for only 12.99) and The Pilgrim Story for C8. Most of these are great programs we've been blessed to review for the Crew. They are accepting applications! Mary at Homegrown Learners currently has a wonderful series going about read alouds. We are currently visiting my husband's family. I think I'll save updates from this trip for next week's Highlights. If you are still with me, thanks for reading about our past two weeks. So, this post was once again two weeks of highlights. I just can't seem to manage my time well enough to get these posted "on time." Twenty-four hours is just not a long enough day! Sadly, it's been a few weeks since I've put a highlights post together. Documenting our learning and life on Homeschooling 3 is important to me, and I hope to manage my time more efficiently in the future. After church (and lunch), I took the little ones to Line Creek Nature Area. It was raining - a nice soft rain, no thunder at all. We try to never let a little bit of rain put a damper on our plans. In fact, it makes nature exploration even more of an adventure. I'm thankful for a little girl who doesn't mind getting a little dirt under her fingernails and boys that are ready for anything outside, too! 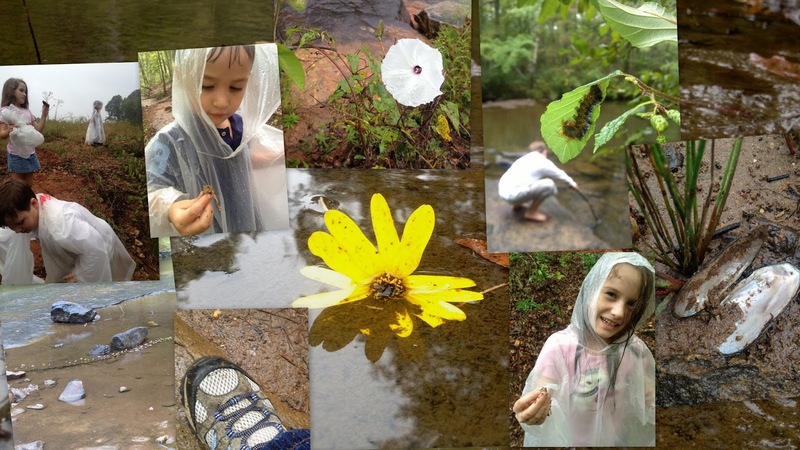 Highlights from our nature walk: lots of wildflowers, a fuzzy caterpillar, two tiny toads (if you look closely you might see the toads in the close-ups of C8 and J4) and the largest freshwater mussel we've ever found at Line Creek. ~ and my waterproof shoes. It was soo nice to have dry feet for our entire 2 hour walk in the rain. R6 pulled his second top front tooth Monday! We finally got to sing "All I Want for Christmas is My Two Front Teeth" to him! The next day he said he wanted to do something special for his brother and sister. R6 took all of his Tooth-fairy money (he's saved every dime) and bought J4 two tiny little Nerf type guns, that came two to a pack, and two tennis rackets and a couple tennis balls for R6 and C8 to share. I just love that he wanted to do something for everyone! Once we got home, they all had Nerf gun shooting tournaments in the basement (Daddy included) and played games with their tennis rackets and balls. For example, they would try to keep the tennis ball going around the racket in a game called Around the World. C8 had been making up many different stories and illustrating them on the whiteboard as she was telling them. She had the boys' undivided attention for at least forty-five minutes! C8 came down with a cold late Wednesday night/early Thursday morning. We had to miss our homeschool co-op. I'm pretty sure we've had perfect attendance for over a year. We missed all of our friends so much! Friday we took a much needed vacation day. C8 was feeling a little better. We traveled to Stone Mountain Park and had the best time! We had pie eating contest winners and contestants on Pumkin Palooza! Here's my blog post about our day. Language Arts: R6 and I are reviewing Primary Art of Language : Reading and Writing program from The Institute For Excellence in Writing. We are laying aside our normal Language program for the next six weeks. I am changing it up a little. We are already spelling, so we are going ahead and beginning AAS, Level I in the first part of the program instead of waiting until part 2. So far, so good. R6 LOVES to supplement Language Arts with Reading Eggs online. I think I've mentioned how much he loves this program before! (We bought him a membership back in March.) This is something he will continue to use. I do believe he'd be heartbroken if I told him we needed to take a break from it for a while. Literature: we listened to Teddy's Button from Lamplighter Theater (There was an excellent sale a few weeks ago on mp3's and ebooks on their fb page.) The kids insisted we finish the audio. It was around two hours start to finish. We LOVE Lamplighter Publishing. The stories we've read or listened to thus far have been excellent. Later in the week, we listened to Charlie's Choice, (by a friend's recommendation) another excellent Lamplighter Theater mp3. The character building values told in all of these stories are absolutely wonderful. 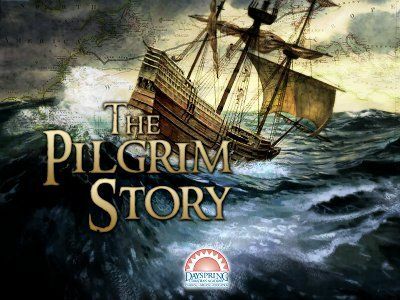 History: we are also reviewing The Pilgrim Story from Dayspring Christian Academy. We've almost finished and have learned so much! Check out the video at the bottom of the link above. It's a resource like none other we've tried. It's been fun! I'll have our review up soon if you are interested. 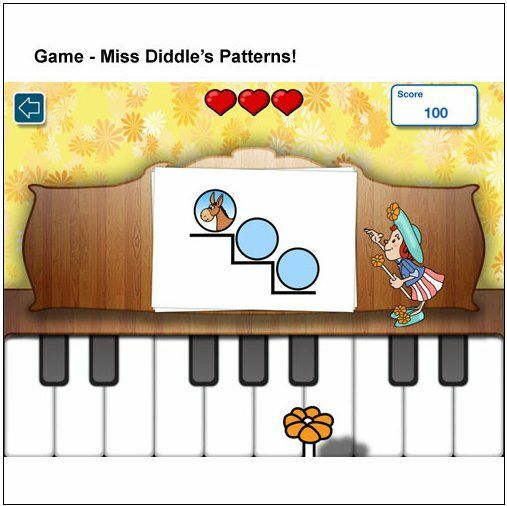 Music: Classroom KinderBach iPad app is another super fun Schoolhouse Review Crew item we have been using for the past few weeks. This review will be ready this week, also. C8 continues to have private piano lessons once a week with the fabulous, Mary from Homegrown Learners. She's doing so wonderfully. ~ How fortunate we are to live close to one another! We are also thankful for their friendship. Bible: Continuing to studying our Awana lessons and verses for the week. Even J4 has a verse to memorize and recite during class. We are still slowly working our way through Heroine's of the Past Bible Study during breakfast. This is still one of our favorite resources. Caraline is a workbook lover. She really doesn't like computer based work, but give her some worksheets or better yet, a workbook and she is delighted. So, we've been reading through the lessons for A Servant's Heart (I bought the teacher's manual used for $5) as a family and she's been doing the workbook part of the lessons. This is the first thing she wants to work on after breakfast each day! Math: We've been using ZooWhiz, mainly for supplementing our math lessons. It's a cute online educational program for reading and English, too. Here's our review of ZooWhiz if you'd like to read it. It's on sale right now for $14.95. They also offer a FREE membership. And, there you have it. Our week and favorite resources at a glance.